You can create charts to display the status and latency of your uptime checks. If you haven't created an uptime check, you must create one prior to creating charts. See Creating uptime checks for details. At the top of the page, scroll the header and click the Metric tab. Enter Check passed for the metric. In the drop-down list that appears, select monitoring.googleapis.com/uptime_check/check_passed. If the Resource type is not automatically populated for you, select the resource type that has the uptime checks you want to monitor. In the Aligner drop-down list, select count true. In the Reducer drop-down list, select none. In the Alignment Period field, enter 20 m.
See Aggregation for more information on these settings. You can use the Monitoring uptime_check/request_latency metric as a basis for uptime check latency charts. 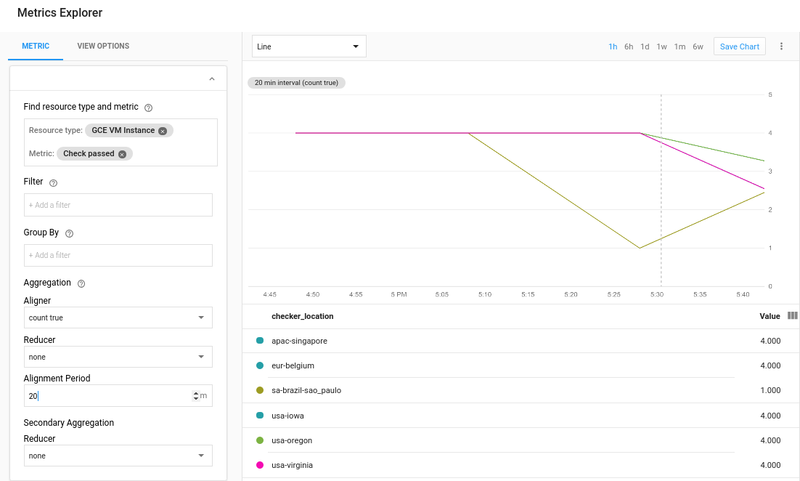 Your choices of the Aggregation fields let you create different charts. You can, for example, set these fields to display the maximum latency or to display the total latency. Enter Request Latency for the metric. In the drop-down list, select the metric monitoring.googleapis.com/uptime_check/request_latency. If the Resource type is not automatically populated for you, select the resource type that has the uptime checks whose latency you want to monitor. In the Aligner drop-down list, select mean. See Creating a new chart for a dashboard for details on creating dashboard charts. 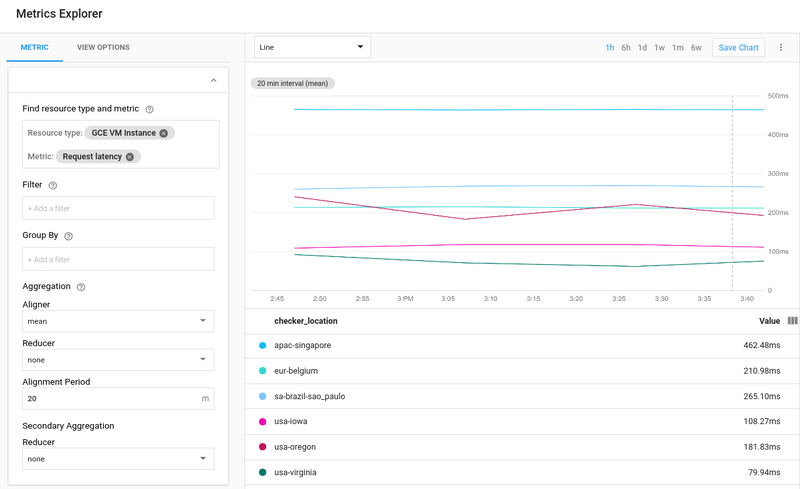 See monitoring for a list of Stackdriver Monitoring metrics.